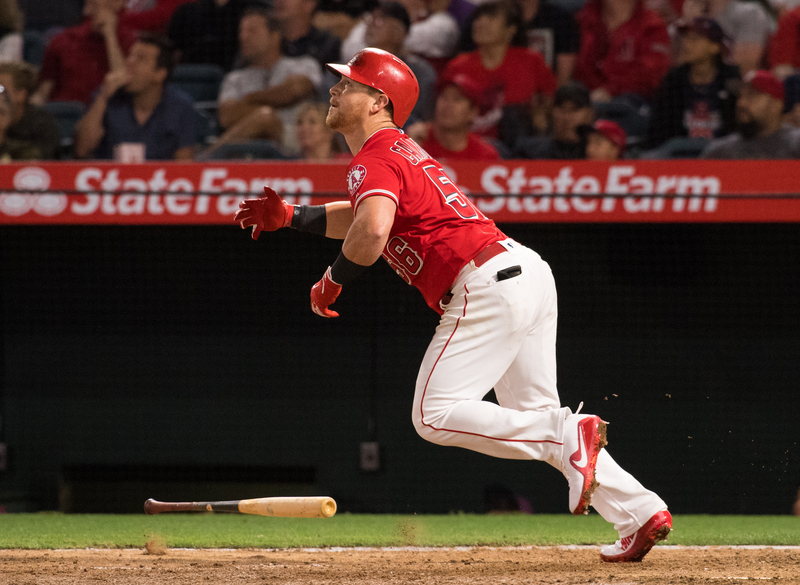 KOLE CALHOUN hit one of the Angels’ two two-run homers in their 4-3 win over the A’s on Friday in Anaheim (Angels photo). The Los Angeles Angels overcame Friday night. They overcame a three-run first inning deficit. They overcame the absence of Mike Trout, now on the 10-day disabled list with a lame right wrist. Finally, they overcame the hole they had dug themselves in with their fourth straight win. By posting the 4-3 victory over the Oakland Athletics, the Halos saw their record inch above .500 at 59-58. Pena did improve, shutting out the A’s over the next four innings. Four relievers yielded just one hit and no walks or runs the rest of the way. Jim Johnson (4-2) got the win, although he only pitched one-third of an inning. The decisive blows for the Angels came with a pair of two-run home runs. Kole Calhoun hit his in the third inning, his 13th homer of the season. Justin Upton hit what proved to be the game-winner in the sixth. It was his 24th round-tripper of 2018. Albert Pujols had a milestone, collecting his 1000th hit in an Angel uniform. On Saturday the Angels will again host the A’s (68-48). Tyler Skaggs (8-7) will start for the home team, and Edwin Jackson (3-2) will start for the visitors.